On a recent hike I made a realization: I needed good scissors. For the longest time the only scissors I’ve carried were a cheesy pair from an old sewing kit. You know the kind. They barely cut thread and they certainly can’t cut what I need them too: moleskin. I also realized that the knife I was carrying was too big to cut the moleskin like I needed to so it would fit around my blister. 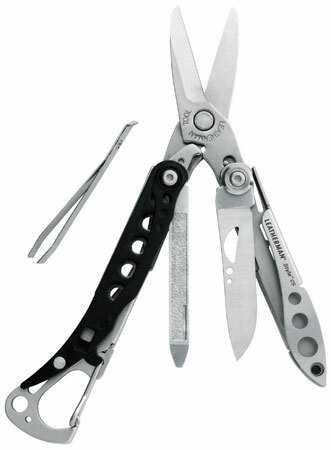 Enter the Leatherman Style CS. I was wandering the aisles of my local Academy when I hit the knife section. I couldn’t stop myself and was soon salivating over the large selection. This tiny multi-tool is what really caught my eye. My current knife, the SOG Flash II, only weighs 3.2 oz but it’s big and bulky. The Style CS weighs in at a mere 1.4 oz and fits easily in my pocket. The Style CS provides 6 tools which for me are the things I’d use the most. I don’t need pliers, or a saw blade, or half the other tools that many of the multi-tools provide. What I ended up with is a knife, screwdriver, tweezers, scissors, nail file, and perhaps the most critical, a bottle opener (that just happens to have a caribiner as well). The knife blade is small but certainly enough to handle the average trail task of cutting into an oatmeal packet or something similar. I have yet to find the need to fend off a bear with a massive Bowie knife so I’m sure this will be quite sufficient. The scissors also did a much better job of cutting the moleskin and I ended up with a usable piece instead of one that had been horribly mangled. If you have trekking poles like my Black Diamond Trail Shocks that may require the occasional tension adjustment the small screwdriver will fit the bill. It’s hard to find anything to complain about. My only beef is that the caribiner is so small that it barely fits around a belt loop. The Style CS ranges in price from about $13-$20 and is well worth it.